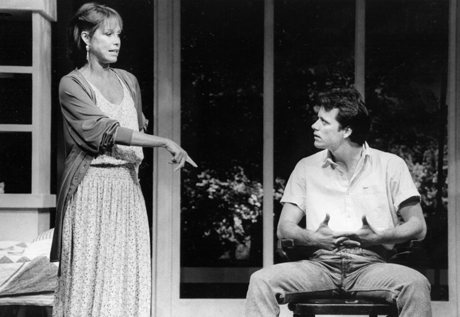 Steven Culp in "Sweet Sue"
Playwright by A.R. Gurney Jr. Although the play requires four actors, there are only characters: Susan Weatherhill, a repressed and uncertain woman in her late forties, and Jake, a young man who is the college roommate of Susan's son. Each of these characters, however, is played simultaneously by two actors, who give expression to the tensions and ambivalences within the characters. The script refers to them as: "Susan," "Susan Too," "Jake," and "Jake Too." Like any playwright, Gurney considers himself far from immune to critics. In the Playbill handed out at "The Perfect Party," Gurney, in an interview, smarts at the recollection of having his first play panned in the Times. At Williamstown, his new "Sweet Sue" was deemed insufficiently developed to be exposed to critics. It was presented at regular prices for its advertised run, but a program note described it as a work-in- progress, and critics were asked to stay away. Gurney and his director, John Tillinger, who staged "The Perfect Party" brightly and smartly, are right to want to shelter "Sweet Sue." 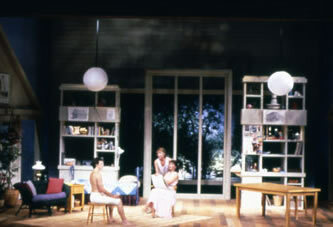 Much progress lies ahead of it, although it can be said that its concept is intriguing, and it advances feelings more strongly and directly than Gurney usually does as a suburban single woman falls in love with her son's college roommate when the latter shows up unexpectedly one summer. The woman (who designs greeting cards and is known as Sweet Sue) and the young man are each played by two actors. Gurney says they aren't meant as light and dark sides, or any contrasting sides, of the same character, but rather as "charcoal sketches presenting several perspectives or positions simultaneously." 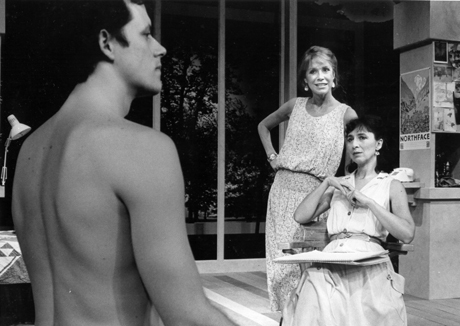 Mary Tyler Moore and Maria Tucci played Sweet Sue; Steven Culp and Barry Tubb played her potential lover. All were engaging, and I look forward to seeing "Sweet Sue" when it's ready. 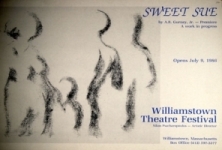 Williamstown Theater Festival announced this week that A. R. Gurney Jr.'s work-in-progress, "Sweet Sue," will be moved to the Main Stage. It had been scheduled for the Extension stage. Artistic director Nikos Psacharopoulos said the move serves "gives the playwright and the cast more time to work out the material in rehearsal, and secondly, it gives more people an opportunity to see the work-in-progress." 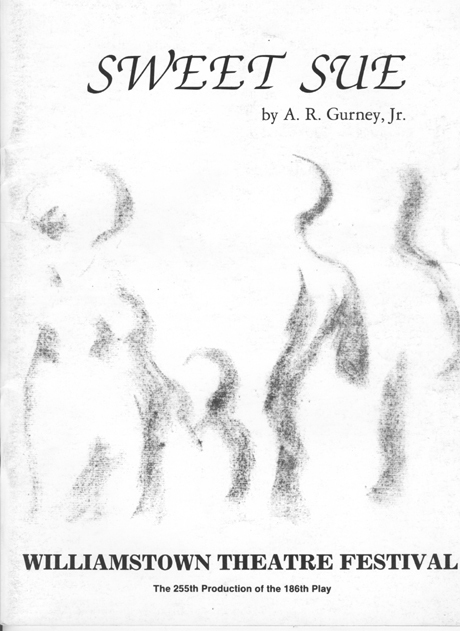 "Swee Sue" is a two-character play that requires four actors to accommodate Gurney's view of the work as "charcoal sketches presenting several perspectives or positions simultaneously." Steven Culp, Mary Tyler Moore, Barry Tubb and Maria Tucci will perform. Coming next to the MainStage at Williamstown Theater Festival: A new play, a work-in-progress, Sweet Sue, by A.R. Gurney of Roxbury, featuring Mary Tyler Moore, Steven Culp, Barry Tubb, and Maria Tucci. MainStage performances are Tuesday, Wednesday, Thursday and Friday at 8:30, Thursday matinee at 2:30, Saturday at 9. Prices range from $6-$18. The Theater is located at the junction of Routes 7 & 2 in Williamstown, Mass. on the Williams College campus. Reservations: 413-597-3400.